Abstract: : The concept of a distributed ledger was invented as the underlying technology of the public or permissionless Bitcoin cryptocurrency network. 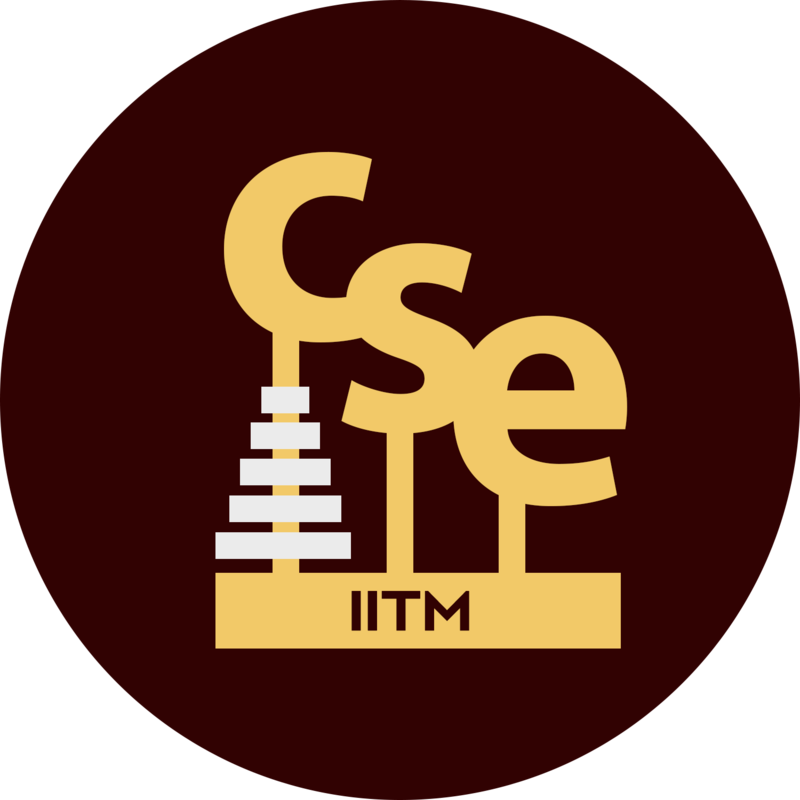 But the adoption and further adaptation of it for use in the private or permissioned environments is what I consider to be of practical consequence and hence only such private blockchain systems will be the focus of this talk. Computer companies like IBM, Intel, Oracle, Baidu and Microsoft, and many key players in different vertical industry segments have recognized the applicability of blockchains in environments other than cryptocurrencies. IBM did some pioneering work by architecting and implementing Fabric, and then open sourcing it. Now Fabric is being enhanced via the Hyperledger Consortium as part of The Linux Foundation. A couple of the other efforts include Enterprise Ethereum, Sawtooth and R3 Corda. While currently there is no standard in the private blockchain space, all the ongoing efforts involve some combination of database, transaction, encryption, virtualization, consensus and other distributed systems technologies. Some of the application areas in which blockchain pilots are being carried out are: smart contracts, derivatives processing, e-governance, Know Your Customer (KYC), healthcare, supply chain management and provenance management. In this talk, I will describe some use-case scenarios, especially those in production deployment. I will also survey the landscape of private blockchain systems with respect to their architectures in general and their approaches to some specific technical areas. I will also discuss some of the opportunities that exist and the challenges that need to be addressed. Since most of the blockchain efforts are still in a nascent state, the time is right for mainstream database and distributed systems researchers and practitioners to get more deeply involved to focus on the numerous open problems. 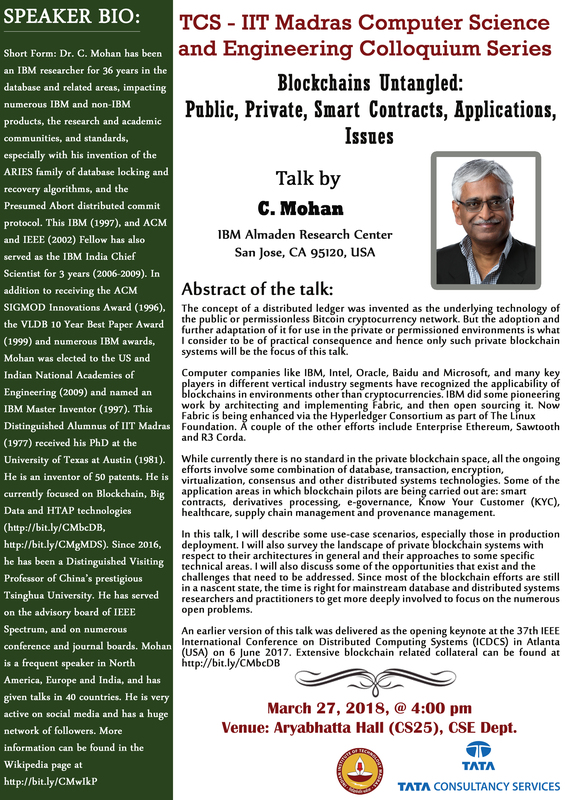 About the Speaker: Dr. C. Mohan has been an IBM researcher for 36 years in the database and related areas, impacting numerous IBM and non-IBM products, the research and academic communities, and standards, especially with his invention of the ARIES family of database locking and recovery algorithms, and the Presumed Abort distributed commit protocol. This IBM (1997), and ACM and IEEE (2002) Fellow has also served as the IBM India Chief Scientist for 3 years (2006-2009). In addition to receiving the ACM SIGMOD Innovations Award (1996), the VLDB 10 Year Best Paper Award (1999) and numerous IBM awards, Mohan was elected to the US and Indian National Academies of Engineering 2009) and named an IBM Master Inventor (1997). This Distinguished Alumnus of IIT Madras (1977) received his PhD at the University of Texas at Austin (1981). He is an inventor of 50 patents. He is currently focused on Blockchain, Big Data and HTAP technologies (http://bit.ly/CMbcDB, http://bit.ly/CMgMDS). Since 2016, he has been a Distinguished Visiting Professor of China’s prestigious Tsinghua University. He has served on the advisory board of IEEE Spectrum, and on numerous conference and journal boards. Mohan is a frequent speaker in North America, Europe and India, and has given talks in 40 countries. He is very active on social media and has a huge network of followers. More information can be found in the Wikipedia page. This is the third talk of the TCS-IIT Madras Computer Science and Engineering Colloquium Series.